The first nine minutes of NBC’s Manifest, the new time travel/missing plane/airline crash series, as been posted online. The series is about a commercial airplane that mysteriously disappears, only to re-appear five years later. While no time has passed for those onboard, the world has gone on without them. Based on the footage, it will be a tense, emotional season filled with surprises. You can see the video, titled “First Act” below. Manifest is written and executive produced by Jeff Rake. Robert Zemeckis will executive produce for his Compari Entertainment with Jack Rapke. Jackie Levine from Compari will co-executive produce. Rake is known for writing/executive producing The Mysteries of Laura as well as co-creating The $treet and Miss Match as well as working on The Tomorrow People. Robert Zemeckis is known for writing/directing all three Back to the Future films, and directing films like Romancing the Stone with Kathleen Turner, Michael Douglas and Danny DeVito, Death Becomes Her with Goldie Hawn, Meryl Streep and Bruce Willis, Contact with Jodie Foster, Matthew McConaughey and James Woods and the recent Allied. 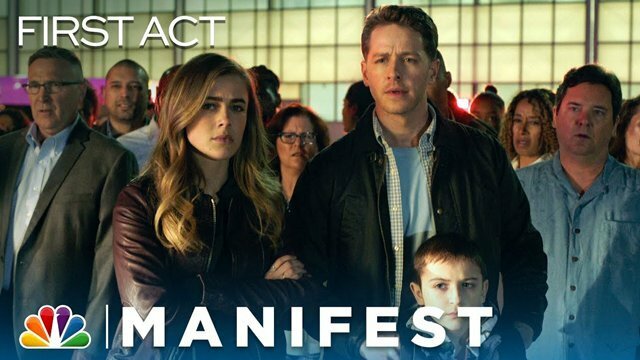 Manifest will premiere on NBC on October 24th. The post Watch the First Nine Minutes of NBC’s Manifest appeared first on ComingSoon.net.